Todays tip breaks down the actual cost of different types of adhesive. 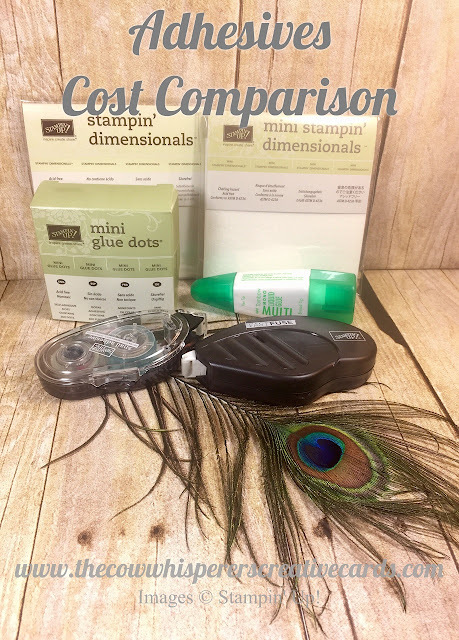 As crafters we're always trying to get the biggest bang for our buck, while using superior products. There are times when we all scrimp a bit here or there with adhesive, to save a little money. Hopefully today's tip will arm you with the information needed, to make the best adhesive decisions for your card creating style. Customer Appreciation. All orders of $30.00 or more before tax and shipping placed on my online store with Hostess Code PQATWMVR will BE qualified for the FREE PDF. This month PDF include 6 cards, showcasing the stamp set of the month Flourishing Phrase and the coordinating Flourish Thinlits . The PDF includes all the measurement, instructions and the supplies list. If your order is over $150 DO NOT enter the hostess code and you will get all the stamping rewards and I will send you the PDF. All qualified order will receive the download by e-mail. Happy Crafting!! !